Since restarting keto again after my basal cell carcinoma surgery, I have had a ravenous sweet tooth. I know, I know, you are supposed to “slay the sugar dragon” and lose your desire for sweet all together… but I am just not there yet. Sometimes I just NEED a little bit of something sweet. Prior to keto my all time favorite was Reeses Peanut Butter Cups, so I set out to make myself a keto version. These keto peanut butter cups aren’t exactly the same – but they sure are close! And one thing is for sure – they are absolutely delicious. 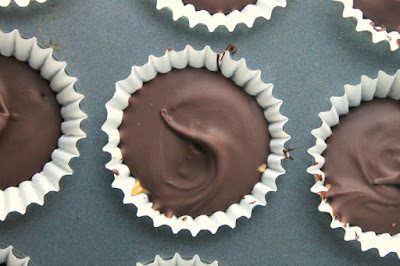 Simple and delicious - these Keto Peanut Butter Cups will cure even the strongest sweet tooth! Combine the peanut butter, Stevia, butter, and salt until smooth. In a microwave, melt chocolate chips, vanilla extract, and coconut oil for 30 seconds to a minute, and stir until smooth. Drop teaspoonfuls of the chocolate mixture into paper-lined miniature muffin cups. Drop a scant teaspoonful of peanut butter mixture into each cup, and top with another teaspoonful of chocolate mixture, spreading it around with the back of the teaspoon to cover the peanut butter mixture. Refrigerate until set. Refrigerate in an airtight container to store. 0 Response to "KETO FRIENDLY PEANUT BUTTER CUPS"